When we found the island, waterworn, green and gorgeous, we thought: what if we gathered everything good and brought it here, left the rest? What if the villains stayed behind, the dangers, the wilds? It was several of us fairies who came upon the place, and for a month we stayed there, set up camp in an old birdhouse, ate fruit off the trees, swam in the seabrine. There were quiet bays and cool mountains, lakes, rivers, the ruins of a castle on the highest peak. “Was this made just for us to discover?” we asked. There was no sign of lives lived there, but why would anyone want to leave? We met to discuss the plans, mapped the territory. We said, “Here is where the white nymphs will live, this will be their lake.” We named a field for the Centaurs, vowed to build a small but sturdy rowboat for the Snow Queen. We designated a good sitting rock for Hercules and a cave for the Hydra, a field for Cadmus to sow dragon teeth. Avalon is the name of one side of the mountain and at the base is a cottage for Red Riding Hood with a field of wheat nearby for Little Boy Blue. Once we began it was hard to stop: Here is where Bo Peep will tend—and never lose—her sheep, here is Pixie Town and the Emerald Beaches, Kelpie Bay and the Gold Caverns. We hardly slept in those days—we were so filled with possibility. A world of only good. When we made our invitations, all the creatures accepted. The island began to fill. Cinderella needed a good house and so did Miss Muffet. We built a tower for Rapunzel but left it unlocked so she could come down. Rockabye Baby needed a strong, low branch on which to swing. The dwarves needed many caves, much work. We didn’t notice the overquiet for a while because we were all busy moving in, brushing stoops with straw brooms, hunting for diamonds in the cliffs, swimming out in the sunset to the raft the mermen had made of driftwood. And then, the quiet. The elves were nervous without the giants. The light was nervous without the dark. Even the waves were searching. Even the air was waiting. We started to bicker. We started to shake each other’s trees to see what kinds of fruit we could knock loose. The Three Wise Men stole plums from the Palace of Old King Cole and then gave them away out of guilt, the Hydra fell in love with Psyche and its love was not returned. Pegasus chased Pan around the wishing well, nipping his ankles. Some of us just slept. The fields were filled with afternoon nappers, tired from boredom and leisure, nothing to talk about or do. After months, a storm. It broke at dawn, the sky a huge mouth, devouring us. We thought all of us would die. Puss in Boots took cover in the Honeymouth cove. The Centaurs went forestward, hid in the thick brush. Anything that swam was tossed in the waves. Us fairies huddled in our birdhouse, our wings refused to still, the whole box shivering. Rain and rain crushed and battered. Lightning sliced. It seemed like weeks and maybe it was, but we did not die. We woke up into a day that was clear and warm, but right away there was something different and that difference was a darkness in the west and when we came out of our shelters and got brave again we walked toward the darkness, the sky purpled, and we saw that the waves crashed on the cliffs that had once been serene and we saw a valley of fire and a sky full of witches and cliffs in the shape of an ogre’s tongue. And do you know what we did? We fell into each other in tears of joy. What is a creature of good without a creature of bad? We were electric again. We were finally home. 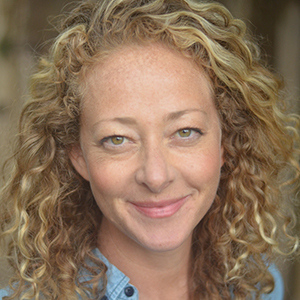 Ramona Ausubel is the author of Sons and Daughters of Ease and Plenty (June, 2016) as well as No One is Here Except All of Us, winner of the PEN Center USA Literary Award for Fiction and A Guide to Being Born, a New York Times Notable Book. Her work has appeared in The New Yorker, Tin House, One Story, Ploughshares and elsewhere. She is a faculty member of the low-residency MFA program at the Institute of American Indian Arts in Santa Fe, New Mexico. It is in this location that I dug for treasure in the arroyo, stomped in monsoon summer puddles, and avoided the black widow nest when checking the mail.